Parkman Elementary School principal Sonja James talks with a parent outside the school in March. FULLER PARK — The school day ended outside Francis Parkman Elementary School the way it usually does, with kids streaming out and goofing off with one another. But some of the students and the parents waiting to pick them up seemed to grasp the reality that the building at 51st and Wells streets would be closed for good after Wednesday’s dismissal. “It’s an emotional conversation because of my family history,” said Latonia Jackson, a 1986 Parkman graduate, longtime volunteer and school special education assistant whose three kids are Parkman grads. 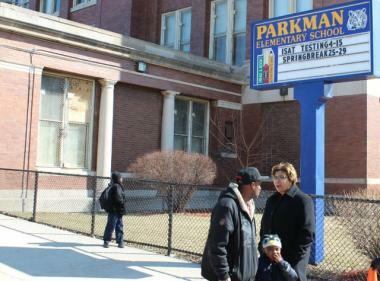 According to CPS data, Parkman was underutilized, with an enrollment of 231 students but room for 570. The school has been on academic probation since the 2008-09 school year. Kimberly Carodine, 31, a security guard at O’Hare International Airport, said she decided to move her family out of nearby Bronzeville after learning that Parkman would close. After researching neighborhood schools for her two kids, a Parkman kindergartner and second grader, she settled on moving to South Chicago and sending them to Horace Mann Elementary School. “It was my only choice. Everything was turned upside down,” she said. .
Next year, Parkman students will be bused to Jesse Sherwood Elementary, 245 W. 57th St., about six blocks south in Englewood. Not all of the students were pleased to be let out for the summer. Some hugged their teachers good bye, shedding tears as they squeezed. One youngster was tossing rocks at the building when no one was looking.